Even before 2018’s rosé season officially kicked off, it became quite clear that rosé hard ciderwas going to be the most exciting drink of the summer. With the beverage’s overwhelming popularity, it was only a matter of time until we started seeing rosé cider collabs and mashups. 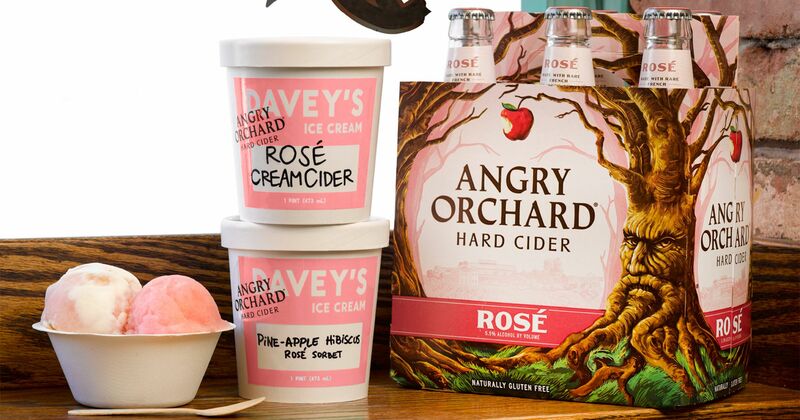 Davey’s Ice Cream has teamed up with Angry Orchard to release two rosé cider-infused ice cream flavors in honor of National Ice Cream Day. According to Ryan Burk, Angry Orchard’s head cider maker, the exciting ice cream holiday prompted this delicious collaboration. “We are always looking for refreshing and unexpected ways for drinkers to enjoy cider. For National Ice Cream Day, we wanted to see if we could deliver the essence of our Rosé cider in the form of a cool treat and found a great partner in Davey’s, whose passion for innovative and unique ingredients resonates in each of the recipes we’ve crafted together.” Together, the companies came up with two flavors, Rosé CreamCider and Pine-Apple Hibiscus Rosé Sorbet. So, was Burk and his Angry Orchard team able to infuse that unique rosé cider flavor into ice cream? We got a chance to try the new flavors to see for ourselves, and it turns out, Angry Orchard and Davey’s delivered. Unlike a lot of gimmicky food mashups, these ice creams are actually tasty and they’re both flavors we would seek out even if they didn’t feature the trendy millennial pink color. Rosé CreamCider is made by swirling Davey’s Sweet Cream Ice Cream with an Angry Orchard rosé cider-infused sorbet. With its combination of creamy and fruity, this treat is like 2018’s cool, grown-up version of a Creamsicle. Pine-Apple Hibiscus Rosé Sorbet is so satisfying that it will have even the most staunch sorbet cynics taking a second bite. It’s made with an Angry Orchard rosé cider base which then gets infused with pineapple juice and hibiscus. It’s fruity, slightly floral, and oh-so refreshing. Additionally, both flavors are a little bit boozy, without giving off an overwhelmingly alcoholic taste. Both limited edition rosé cider flavors will become available this Friday, July 13 at select Davey’s Ice Cream locations in New York City. From Friday through Sunday — which just so happens to be National Ice Cream Day — customers can buy scoops of both at the Williamsburg location, pints at the Greenpoint location, and both scoops and pints at the East Village location. Angry Orchard will also be selling scoops on Sunday, July 15. If you’re 21 years or older, we recommend you put a boozy twist on your National Ice Cream Day with these more-than-just-trendy treats.